Meet Good Food Month’s hatted Renaissance men. The theme for the Fine Dining with Hatted Chefs event is ‘Renaissance’. Carla Grossetti caught up with two acclaimed chefs who are teaming up for the occasion. The Dave Vince Code. The Two Daves. A Tale of Two Daves. Michelangelo’s David. These are just a few of the names chefs David Moyle and David Verheul brainstormed to describe their headline act at Melbourne Palms, Good Food Month’s pop-up restaurant in June. “There were some lairy names thrown around. We tried to come up with a few quirky names for the event but the problem is, neither of us are funny,” laughs Moyle. “The evening will be about having conversations around food and the tradition of cooking and we have settled on a Renaissance-inspired theme because we are both influenced by Italian culinary traditions and love that period of art and culture,” he says. The dinner, which will be hosted by Good Food’s national print editor, Ardyn Bernoth, will be held in The Palms Springs-themed pop-up. “I don’t want to give too much away, but it’s going to be a bit tongue in cheek. We want it to be representative of us in everything from the Renaissance styling and the feel of it to the food. Dave and I are already on the same page as cooks. But it’s important to have a thread to follow if you are collaborating with another chef. You can’t replicate a restaurant meal outside a restaurant; it doesn’t work,” Moyle says. “David and I have worked together before and the dynamic between us is great. We are both focused, but relaxed. It’s not an interactive event, but the food is interactive as it’s lots of whole pies and food you need to share, which is fun in itself,” he says. Back in 2014, when Tasmania’s food scene was starting to really cut loose, David Moyle was grabbing national attention for dishes such as seared bonito on a nettle sauce and braised calamari with borlotti in a puddle of crab sauce. Moyle has since opened Longsong in Melbourne, a Thai-inflected grill and bar known for everything from its crazy-delicious ‘sticks’ (skewers of calamari, chicken and duck heart) to its Moreton Bay bugs grilled with butter. As befits a fine-dining occasion, the two chefs will give us a taste of the bounty of winter, preparing two courses each served with matching wine and cold beer. In addition to being a good opportunity to eat good food in a packed pop-up, the chefs will riff with the Good Food team about their inspiration, aspirations and influences. The Renaissance theme will be reflected in the cooking with the hatted chefs keeping the chilly wintry temperatures in mind to present a beautiful banquet that pegs the event as a special occasion. 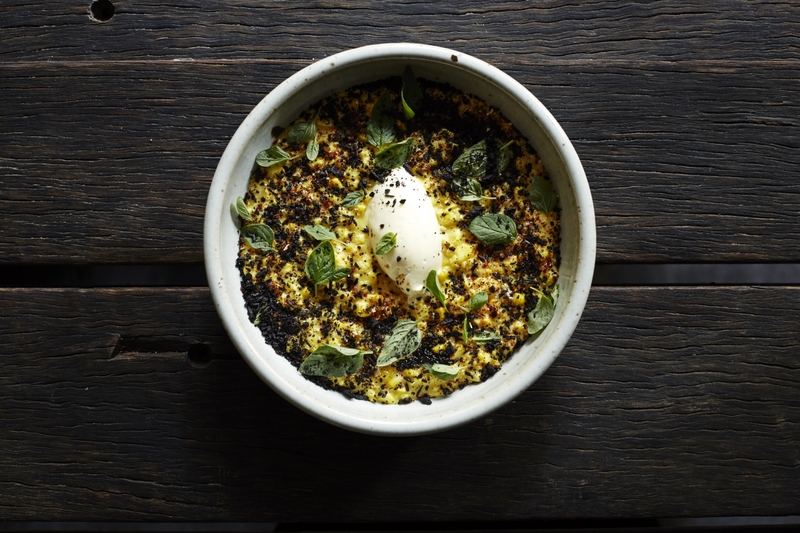 New Zealand-born David Verheul, who honed his craft working in Michelin-starred restaurants in London, says he is looking forward to teaming up with Moyle, who shares his penchant for cooking food over fire. 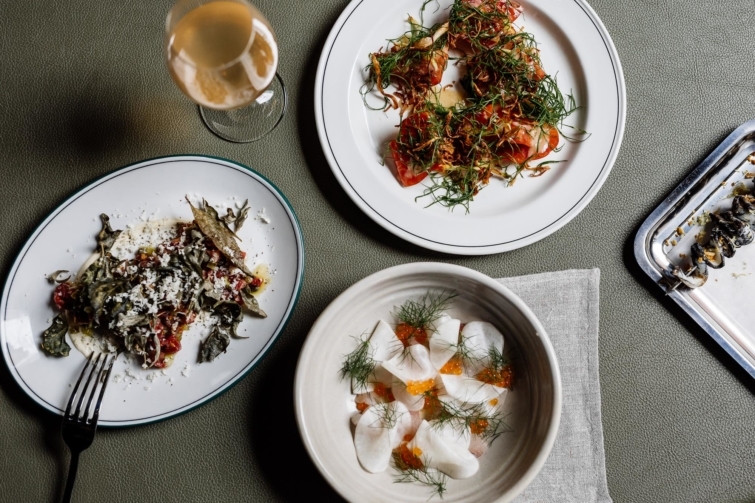 Together with the Good Food Month team, the pair have conceptualised a space where the burble of relaxed chatter, and cheerful clink of wine glasses will become part of the soundtrack. “We’re going to be close to the banks of the Yarra River in a Palm Springs-inspired pop-up, so we want to have some fun with it. We want to do something a little bit different and unique, rather than just a couple of dishes from his restaurant and a couple from mine,” he says. “Dave and I are definitely on the same page food-wise and I think the evening will be a load of fun both back and front of house. I love Dave’s cooking. It’s very simple, direct and operates within a great ethos. He supports craftspeople, small producers and his food is 100 per cent about customer enjoyment,” he says. The Dave-inci Code will be held on Monday June 18 at Melbourne Palms, featuring multiple courses, matched wine, and a chat with the two Daves. Tickets on sale now.